Can you plan a wedding in less than three months? Serra and Amos’ gorgeous wedding at The St Regis Singapore proves that you can! Serra and Amos were re-introduced after a missed connection, and look where it brought them! With lots of encouragement and blessings from their family, the couple tied the knot at The St Regis Singapore in a simple wedding that focused on their family and friends who have been there for them through their journey. Serra: According to Amos, we were first introduced when we were in our early 20s via a mutual friend. I don’t remember that first meeting at all! I think he wasn’t attracted at first sight either. Thereafter, he left for studies in Australia. About seven or eight years later, I was out with friends and my cousin at a KTV session and my cousin invited more friends to join us. Amos was one of them. We started dating casually and things just gradually got more serious, and now we’re married. What do you love most about Amos? Serra: He is responsible, family oriented, filial, generous and kind. The kind of guy you can trust your life with. I feel safe around him and without needing him to say it out loud, I know he will run to me if I were ever in trouble. He is also really good with finances, very practical and level-headed. How did you manage to plan everything in such a short time? Serra: The wedding was planned in two and a half months. We were very lucky to have had awesome vendors and tremendous support. I am so grateful to every one of them! Valerie, my MUA, is a gem. I engaged her at the last minute because I had a MUA who backed out. Valerie is the sweetest person ever. She is calm and so soft-spoken, which helped calm my nerves on the wedding day because everything was just rush, rush, rush! Alex, my photographer, is the coolest ever. He mingled so well with my guests and even made friends! Despite being a joker, he was professional and always around when someone needed a photo taken. Ben, our emcee, received endless compliments from guests after the wedding. He was amazing. He helped us make sure everything was on schedule and smoothly run. Elvin, our DJ, really built up the atmosphere and got everyone into the mood. You don’t find DJs like that every day. He is really good! Ming Da, our magician, intrigued our guests with his tricks all night, and we jokingly called him the Pipe Piper because he had a trail of followers following him everywhere he went. They couldn’t get enough of him! Jessica from CC Lee had to endure a lot of my indecisiveness, but she was professional and patient throughout the planning process, and the flower set up was so beautiful. She was the one who suggested the circle dome and drapes on the stage. I couldn’t picture it and was hesitant, but I’m so glad I took her suggestion because she was right! It was gorgeous! Last but not least, I’d like to thank all the folks at St Regis. It was a very pleasant experience from the first meeting with Liyan, who helped us get everything organised, as well as Maran, Wen Hui and the entire team who were present at the wedding that night. Did the wedding turn out the way you wanted? Serra: The wedding was themed around the idea of “Happiness, Laughs and Love”. There were a few criteria I had wanted to achieve. Firstly, it had to be enjoyable for my guests. I felt that, since my family and friends had made the effort to attend our wedding to give us their blessings, I had to also ensure they enjoyed the night as much as we would. Secondly, I had wanted my guests to mingle. We had a dance floor, a magician and a fantastic emcee, Ben, entertaining guests throughout the night. Families from both my side and Amos’ side were dancing together and everyone mingled. From the start, we had already decided that our wedding wasn’t going to be just about Amos and I. We wanted to share this love. It was my greatest pleasure watching couples hugging each other on the dance floor, and watching elderly parents and their children dancing. The pictures my awesome photographer snapped were testimony to the fun and love experienced that night. We skipped a lot of the traditional ceremonies, and we had no morning event. We woke up at 11am on that day! Our solemnisation was at 5 pm, followed by tea ceremony. That helped to keep us bright-eyed through the night. In my opinion, the wedding was a blast and we couldn’t have achieved it without the help of our vendors, family and friends. I’d like to especially say thanks to Wen Hui for her guidance that day. Serra: It has got to be everyone’s happy faces captured on film, definitely! I am also thankful we both have very supportive families who allowed us to plan the wedding the way we wanted. And, there was also a YMCA human train at some point! Credits: All images by Whitebear Wedding. 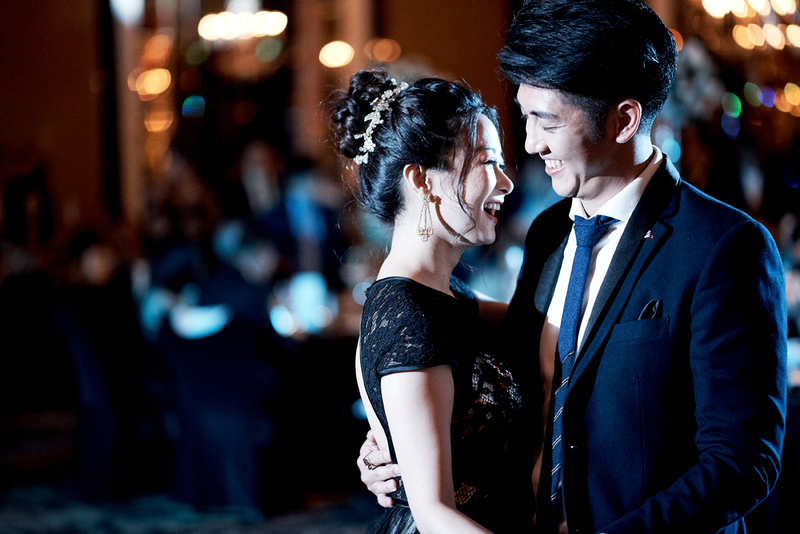 Want to see your love story featured on SingaporeBrides too? Submit your wedding here!